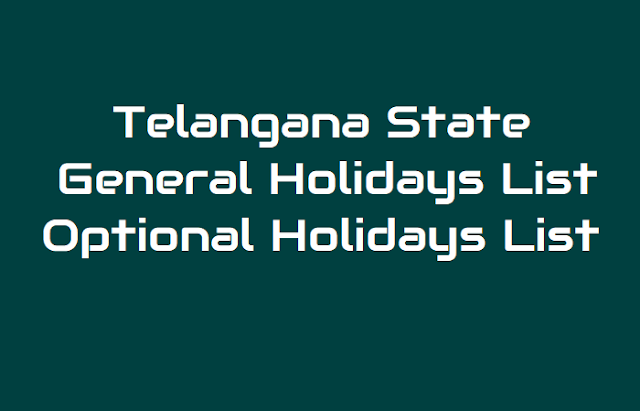 TS General Holidays List, TS Optional Holidays List: Telangana government has released list of holidays for govt offices for 2019: The State government notified the list of general holidays and optional holidays for the year 2019. Chief Secretary issued necessary orders in this regard, asking all the state government offices to strictly observe these holidays and also remain closed on all Second Saturdays and Sundays. Government declared public holiday on January 1 marking commencement of English New Year. In addition, the State government employees may also avail themselves of five Optional Holidays during 2019, irrespective of the religion to which the festival pertains. To avail these holidays, employees have to apply for, in writing in advance. However, general holidays are not applicable to industrial establishments, public sector units, public work departments and educational institutions in the State. Administrative departments concerned will issue separate orders to this effect. The State government has notified general and optional holidays to be observed by all the State government offices during the year 2019. Though government offices remain closed on all second Saturday of every month and all Sundays, February 9, a second Saturday, however would be a working day in lieu of a holiday declared on January 1. In addition to the notified general holidays, the State government employees may avail optional holidays not exceeding five on the festival/ occasions. In case of any change of date in respect of Idu’l Fitar, Idu’l Zuha, Muharram and Id-e-Milad as per the moon sighting or any other holiday declared now, it would be notified accordingly. Birthday of Hazrath Ali (R.A) on 03.2019 (Thursday) which would have been Optional Holiday is declared as General Holiday in view of Holi. Naraka Chathurdhi on 10.2019 which would have been optional holiday is declared as General Holiday in view of Deepavali.